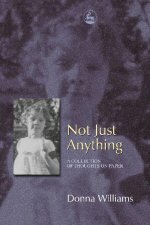 Published in 2004, Not Just Anything is a mosaic of logic, passion and philosophical musings by Donna Williams, sometimes jolting, sometimes moving, often illuminating. In it Donna takes you on a poetic adventure into places past, present and beyond. Often intertwined with the world of autistic experience, her writings divulge with immediacy, a person in the grip of overload and shutdowns, of extreme sensory and emotional highs and passions, of alienation from self, from body and fear of the intensity of emotion, of the struggle to know self, to communicate, to comprehend. At other times, her writing somehow transcends the often assumed limitations of autism, and she dissects so many of the concepts we take for granted, bringing us face to face with our own social constructions of 'reality' and so called 'normality' in a way only Donna can.